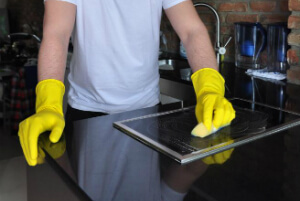 Oven Cleaners Commercial & Domestic Kitchen Tower Hamlets E | Quality Property Care Ltd.
Quality Property Care Ltd. is a professional oven cleaning company, which provides domestic and commercial oven cleaning. We deep scrub ovens of all kinds for professional kitchens, offices and homes in Tower Hamlets E and the area. The oven cleaning service involves the disassembly, scrubbing, cleaning and soaking of every single part and then assembly of the oven. The service is performed by insured, trained and certified oven cleaners at an excellent oven cleaning price. Together with the deep oven cleaning, you can book microwave cleaning, cleaning of your freezer, fridge, cooktops, BBQ, grill and warming drawers, as well as an overall home and business kitchen cleaning. Save energy and cook healthier food after the safe and green deep oven cleaning service. No matter what type of cooker or oven you have, contact us by phone or online right away, and get a free quote for the requested service. All of the cleaning is performed with child and pet safe, organic detergents. Our detergents have antibacterial properties, keeping your kitchen fungal-free. For fridges we use a special detergent with a long lasting effect but with no dangerous effects for the food or your health. We put aside any detachable fridge parts and clean them individually, removing any dirt from them. The main body of the fridge is deep cleaned, removing any streaks, pieces of fruit and food from the racks. To remove unpleasant odours we use an odour neutralizing agent. Each appliance is treated with suitable detergents, all of which are eco-friendly and assure the safety of you and your family. All detergents are of the highest quality, and are 100% child and pet friendly, and environmentally friendly as well. You can use the oven or your other kitchen appliances immediately after it has been cleaned. 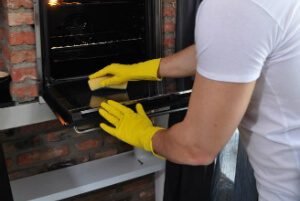 Don’t waste any more time wondering about getting a professional deep oven cleaning, and book your service today! As soon as everything has been cleaned we put all parts together and let them dry. The surface of the stove is treated with a professional finish for the glass part of the oven door to prevent mild scratching. You inspect the completed job and determine if it’s up to your standard or not. If you are not happy with it, the cleaners will attend to the areas which cause the problem and clean them again for free. We also deliver full kitchen cleaning including light switches, all surfaces, outside and inside of appliances with deep cleaning of cupboards, fridges, sinks, freezers, hard floor. This is a service which allows us to properly clean your freezer or fridge, from the inside and out. First we inspect the freezer or fridge and see what exactly needs to be done and cleaned. Every part that can be detached is removed and cleaned. We use a organic mixture to remove any leftover food particles and stains. It removes and prevents bacteria and mould growth inside fridges and freezers. Each part , when it is fully cleaned, is put back inside and the freezer and fridge are left to dry. Once completely dry they can be used straight away. Barbecues and grills tend to accumulate a great deal of food on them. A lot of burnt meat is left if not cleaned afterwards. This build up of carbonized matter releases gases during the cooking process. It enters the food and makes it taste a lot more different. We soak the detachable grill and BBQ parts to eliminate any grease and residues. Once everything is cleaned, it is reassembled. The grill and barbecue are ready for use. Free your oven from bacteria and dirt! Book via phone or the online booking form today! Receive more information and get a free quote for oven cleaning services in Tower Hamlets E now! Call us on 020 3746 4287 at the best time for you and we will set up your fast and efficient visit!